Published in the Rafu Shimpo, February 25, 1958. 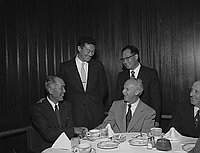 A Caucasian man, Joe Littlefield, TV Garden consultant, and a Japanese man, Morio Hayashida, past president of the Southwest chapter of Southern California Gardeners' Federation, shake hands at the installation dinner for the Southwest Gardeners' Federation officers held at Nikabob, Los Angeles, California, February 22, 1958. 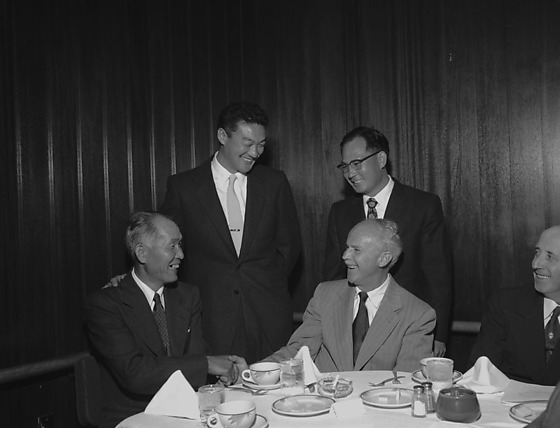 The older two men sit at a table covered with napkins and tableware. Two smiling younger Japanese men stand behind them, new officers president Jerry Hashii, left, and executive vice-president Minoru Mizakane, right. An older balding Caucasian man watches at far right.